Reward your students with the popular Cross and Crown School Recognition System. Recognize your student for perfect attendance with this attractive 3-Month Attendance Pin. It features a rhodium (silver) plated finish. The cross and crown symbol appears with the cross in red and a silver outlined crown. An “S” is placed on either side. 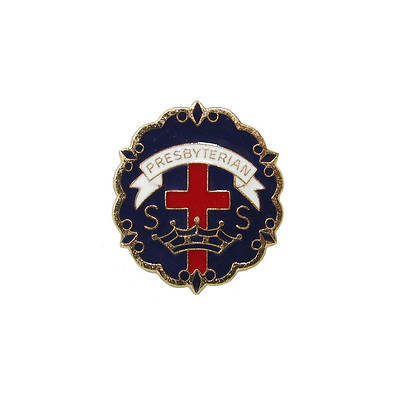 The word “PRESBYTERIAN” appears above the symbol in a blue banner. It has a pin-back attachment and safety catch.